Being a Citizen is an inclusive, adult education program for participants with diverse abilities. There are two main areas of emphasis – academic skills and social communication skills. Participants continue to develop and build upon the academic skills acquired in high school. At the same time, participants learn to communicate more effectively while navigating the expectations of the adult world. Being a Citizen provides an opportunity for learners to explore themselves, their strengths and challenges, develop interpersonal communication skills, employability skills and build relationships with others. Being a Citizen is a strength-based program that focuses on the accomplishments and positive qualities of each participant. The development of effective social communication skills is at the core of Being a Citizen and is infused into all areas of the curriculum. Fees are conditional upon circumstances. The Best Buddies program matches people with disabilities with students from UVic who wish to volunteer. Our program gives people with disabilities the chance to have experiences that most people take for granted – going for coffee, out to a movie, or simply enjoying the company of a good friend. Matches are made according to interests and Buddy Pairs meeting once or twice a month to do something fun together. We also organize several group events where everyone is welcome to join in the fun including hikes, watching sporting events like hockey or basketball, karaoke, and movie nights. This program runs through the school year, September – April. The Community Engagement program uniquely tailored to each person’s goals. It may be one-to-one support or engaging with peers in preferred activities. This is an opportunity to receive intentional coaching and mentoring to meet your goals. Goals may be social, academic, work-related and recreational. Days and times are dependent on personal choice. The Employment Program is for individuals who are interested in exploring their potential for employment. Our customized employment program operates under Employment Program BC (EPBC) guidelines in partnership with GT Hiring, our local Work BC Employment Services administrator. We offer Customized Employment Development Services (CEDS) that combine service options to effectively support the unique needs of a job seeker. CEDS involve creating a job or self-employment opportunity that is customized to the individual needs, skills, abilities and contributions of an individual. Our Employment Facilitator will meet with you to assess your employment support needs and provide one-to-one individualized job search support. Individuals will complete a comprehensive, strengths-based discovery assessment. The assessment is a person-centred approach to understanding the individual, their strengths and abilities, as well as what supports may be necessary for their success in the workplace. Based on the results of the discovery assessment, employment support provided to individuals may include: career cruising, unpaid work experience, customized employment development (working with employers to create a position based on the strengths and needs of the job seeker), job development (assisting individuals to pursue traditional employment opportunities and employment counseling). Job coaching is provided for employment retention once a job placement has been secured. Days and times for some employment supports are dependent on personal choice. Family Governed groups are groups of families who decide to pool their CLBC funding together to create more supports for their sons and daughters. Family governed groups will use an agency, like Lifetime Networks, to help facilitate the program. Lifetime Networks is proud to host InclusionWorks! South Island, a group of 10 families who chose this option with their family member. Families are involved in decision-making and often participate in hiring decisions, programming and visioning with their family member. For more information about the InclusionWorks! Model and how to start your own family governed group click on the links below. 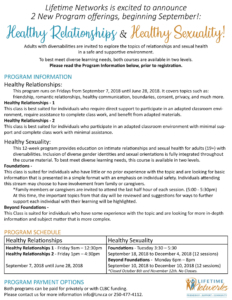 Adults with diversabilities are invited to explore the topics of relationships and sexual health in a safe and supportive environment. Please read the Program Information below, prior to registration. Connecting with people and making friends can be very difficult; in fact sometimes almost impossible! At Lifetime Networks we understand the importance of friendship as being one of the cornerstones to a fulfilling life. Through our Networks we help people with disabilities develop and maintain lasting friendships. Each Network is created for a specific individual with focused goals and activities that meet the individual’s needs, interests, and lifestyle. Once formed, a Network is a group of 3 or 4 friends who spend quality time one-on-one with the person at the centre of the Network. Network friends may go to movies, out for dinner, to a concert, hang out at home…it’s all about the friendship and support. The Networks can last a lifetime and ensure unpaid relationships and true friendships are a reality. Each Network has a Facilitator to help make sure the friendships are going smoothly and to act as a mentor whenever necessary. Outreach Support is for people who are living on their own, or planning to live on their own, and need a little extra support to be successful. Each individual’s Outreach Support is based entirely on their personal goals, needs and the disability related supports they may require. Other times it’s more of a mentoring relationship to increase personal safety and good decision-making. This program will be tailored to you. We’ll work together towards independent success. Our Fall, Winter and Spring 2019 Sessional Social Groups are Now Open for Registration! This year’s programs include Cooking Classes, Saturday Socials, Art Studio time and more. Program information, prices and times can be found by clicking the schedules below. phone: 250-477-4112, email: info@LNV.ca or by visiting us at #102-4090 Shelbourne street. Come have some fun and meet new friends! Budding new artists, musicians, and friends always welcome! Click these links for our Fall, Winter, Spring and Summer BBQ Schedules! For those interested in fine arts we offer the Lifetime Networks Theatre Troupe! Participants in this program create, write and perform their own show two times a year to often sold out crowds.